This cable is designed to connect GROM AUX, IPOD, USB, Android, Bluetooth car interface to the back of your VW, Seat, Skoda double DIN stock stereo. The Double DIN stereo is 4 inches in height, the single DIN is 2 invhes in height. The cable works for VW, Seat, Skoda Double DIN stereos only ( not for AUDI). 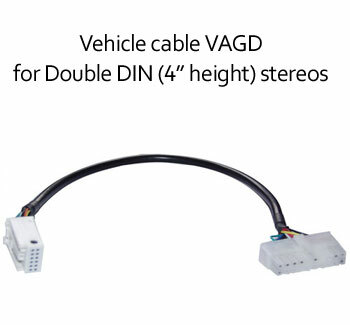 The VAGD cable connects directly to the CD changer port of the VW, Seat, Skoda Double Din stereo.